Adding a photo shouldn't break your site or your spirit. Photo albums (sometimes labeled photosets) can be very useful. Creating these allows you faster and more organized image sorting when using photos on your site. It also creates the album of images that can be used to show multiple images in a photo tour on the page. 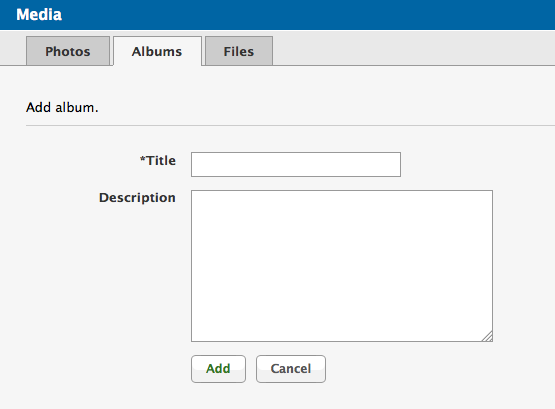 To add photos to albums you can either directly upload photos to an album or move them into an album after uploading photos. To create a new album and add photos you should click the “Media” tab in the right section of the top bar when you are logged in to your website. This will bring up a box that shows all the existing media on your site. It will default to the Photos tab, so you must select the “Albums” tab. Click the “Add Album” button. Fill in the fields for the new album and click the “Add” button. This will take you back to the list of all albums. Find the album you want in the list and click the “View” link to the right. This will show you the photos already in the album (none if it’s new), and you can upload photos directly to the album by clicking the “Upload” button. To add already uploaded photos to an album, navigate to the Photos media section and select the photos you would like to add to an album. Then click the “Move to” button in the top left hand corner. This will show a drop down of albums you have created on the site. Select the correct album from the drop down list and photos will be moved into the album.